You are here: Home>People>Village people>Gordon Banks opens the Davis estate, early 1970s I think. 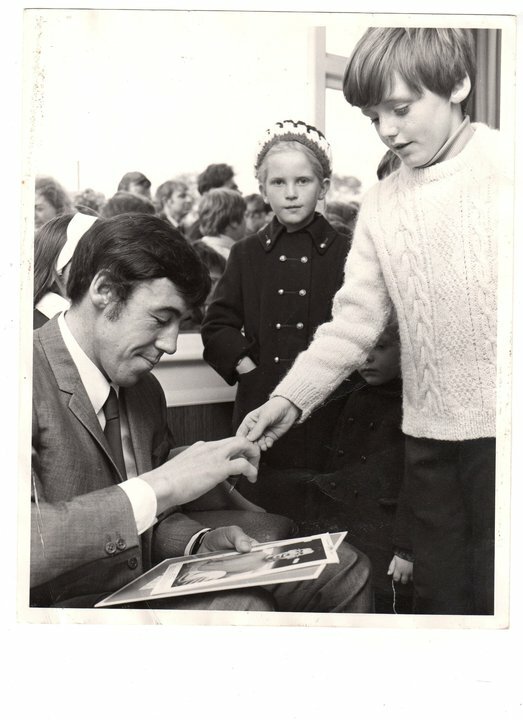 Gordon Banks autographing Trevor's Typhoo card in the early 1970s. I came across this picture recently and it took me back to the time when Gordon Banks opened the Davis Estate at the end of the village. I’m the young lad getting his Typhoo Tea card autographed by the legend that is Gordon Banks. I still have the card somewhere in the loft. At the time we, lived on Wyggeston Avenue. The picture was taken by the Grantham Journal and appeared in the paper soon after. Gordon Banks was Britain’s greatest goalkeeper in the 20th Century. He played for Leicester City and Stoke City, and was capped for England 73 times. He was Stoke’s goalkeeper in the 1972 League Cup win, but a car crash in October 1972 cost him both the sight in one eye and his professional career [Wikipedia].